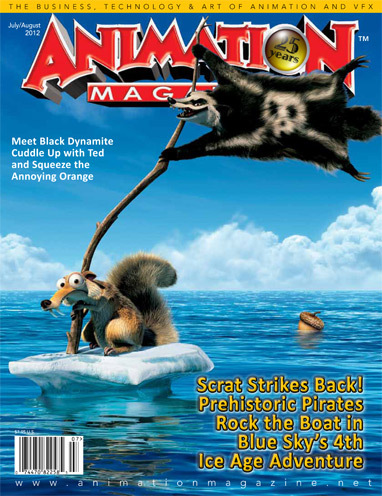 Scrat and Mammoths and Pirates, Oh My! - The fourth installment of the Ice Age franchise introduces several new characters as well as meticulously rendered visuals to draw fans back into theaters. He's a Bad Mother … Shut Yo Mouth! We're only talking about Adult Swim's newest animated star and his funkadelic show, Black Dynamite! Can ya dig it? Inside Cartoon Network's Super Hot Summer - An offbeat Internet fruit sensation, a group of animated reality kids and mystical LEGO fighters add an extra punch to the cable network's summer lineup. Cartoons @ Comic-Con - Before you have a scheduling-induced panic attack, consult our list of cool toon events to squeeze in at the San Diego event this July 12-15. Extreme Webslinging Ahead! - Our writer goes behind the scenes of Sony's Amazing Spider-Man reboot to uncover the secrets of some of its high-end visual effects. Ice Age: Continental Drift, Black Dynamite, Amazing Spider-Man, Ted, Cartoon Network, Comic-Con and much more!